Pepper pot. Bulldog. Firebrand. Scrapper. Solly Hemus answered to all those descriptions in 11 years as a major-league player and 2½ as a manager. “Solly was a hell-bent-for-leather, fiery ballplayer with limited talent,” said Cardinals general manager Bing Devine.2 The left-handed batting infielder’s greatest skill was putting his body in the path of pitches; he led the National League three times. Noisy and combative on the field, he was personable and funny outside the lines and a prolific writer of thank-you notes. One note got him the job as Cardinals manager. The family moved to San Diego when Solly was a toddler. He recalled growing up in a poor neighborhood where white, black, and Mexican kids played together and fought each other.4 He played baseball at St. Augustine and San Diego high schools, but the 5-foot-9 second baseman attracted no attention from professional scouts. After graduation in 1941, he enlisted in the Navy. His mother had to go with him to the recruiting station because he was a minor. Hemus served for four years during World War II as an aviation ordnanceman, the sailor who arms the planes on aircraft carriers. While in the service he married Marguerite Maguire. After he was discharged in November 1945, the Brooklyn Dodgers signed him, but he didn’t make it out of spring training. He argued with his manager and was released. Hooking on with the Cardinals organization, he posted a .363 batting average at Class-C Pocatello, Idaho, in his first season. That won him a promotion all the way to Double-A Houston in 1947. In three seasons in Houston, Hemus established himself as a promising prospect. When shortstop Marty Marion got hurt in August 1949, the Cardinals called up Hemus and put him at second base, with Red Schoendienst moving to short. Hemus batted .333/.450/.364 in 20 games. He stuck with the team the next spring as a backup infielder, but was sent down to Triple A on July 1. The two overachievers became a mutual admiration society. Stanky said Hemus “plays every game like a school kid on the first day of summer vacation.”8 Hemus modeled himself after the manager, heckling opponents, battling umpires, working bases on balls, and wearing a baggy uniform to make it easier to get hit by a pitch. He was hit 20 times, believed to be a National League record at the time.9 Cardinals superstar Stan Musial gave him a thin-handled bat, and he found a power stroke for 15 home runs, compared with just two the year before. Batting leadoff, he topped the league with 105 runs scored and hit .268/.392/.425 with 96 walks. After the season Stanky acknowledged Hemus’s defensive limitations. “I don’t know where he’ll play if he doesn’t play shortstop,” the manager said, “but we’ll find a place for him.”10 Hemus was back at short in 1953, scoring 110 runs with a .279/.382/.443 batting line. But he led the league with 27 errors. The Cardinals rose to a tie for third place, trailing a distant 22 games behind the pennant-winning Dodgers. “You can’t win pennants with Bilkos, Hemuses and Jablonskis,” St. Louis Post-Dispatch sports editor J. Roy Stockton wrote, “and one must regret saying that, because there’s not a better competitor in the game than little Solly Hemus.”11 Steve Bilko was the strikeout-prone first baseman, Ray Jablonski the defensively suspect third baseman. The front office agreed with Stockton. In December the club’s new owner, August A. Busch Jr., paid the Cincinnati Redlegs a reported $100,000 for Alex Grammas, a highly touted Triple-A shortstop. While manager Stanky called himself a “Hemus man,” he added, “[F]rom all I’ve heard about Alex, he’s going to be hard to keep out of the lineup.”12 Stanky knew better than to put up a fight for his protégé; Busch hadn’t paid $100,000 for Grammas to be a benchwarmer. Cardinals pitchers were relieved. “This is no reflection on Solly Hemus, a scrapper,” said veteran Gerry Staley, “but he can’t move up to big league standards at shortstop.”13 For the next two years, Hemus became an infield handyman and pinch-hitter, with fewer than 300 plate appearances each season. In May 1956 St. Louis traded the 33-year-old to Philadelphia for another utility man, Bobby Morgan. Following a fifth-place finish in 1958, the Cardinals fired their latest manager, Fred Hutchinson. General manager Devine planned to promote Johnny Keane, a longtime manager in the farm system, but owner Busch had another candidate. When Hemus was traded away from St. Louis in 1956, he had written a fawning letter to Busch praising the organization and expressing his desire to return someday. “I thought maybe I could go back as a coach, maybe manage in the minor leagues, something,” Hemus explained later.15 Instead, Busch offered him the big-league job as a player-manager. Managing had long been Hemus’s goal. Throughout his playing days he filled a black book with notes and peppered his managers and coaches with questions. “I have a lot of ideas about managing,” he said, “and I’ve written them all down.”16 At 35, he thought he was ready. He proved that he wasn’t. The Cardinals lost their first three games of 1959 and settled into last place. The panicky freshman manager began shuffling the lineup, even dropping the slumping Musial from his customary third spot in the order to sixth and eventually benching the legend. When center fielder Flood started slowly, Hemus banished him to late-inning defense. Rookie right-hander Gibson was shipped back to the minors after just three ugly relief appearances. “Until then, we had detested Hemus for not using his best lineup,” Flood wrote in his autobiography. “Now we hated him for himself.”20 Flood and Gibson, who rejoined the club in July, were young players, not yet established. “Either he disliked us deeply or he genuinely believed that the way to motivate us was with insults,” Gibson said.21 Roommates and friends, they fed each other’s rage. Flood batted .255 as a part-timer; Gibson was wild and got only nine starts despite a 3.33 ERA. St. Louis rode a patchwork pitching staff to a third-place finish with an 86-68 record. 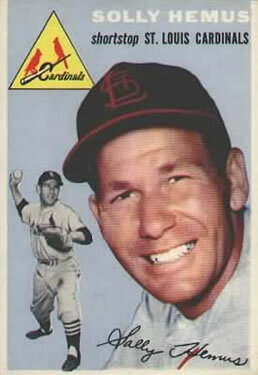 The Cardinals got hot in the second half after young right-hander Ernie Broglio was moved into the starting rotation. His 148 adjusted ERA was the league’s best as he finished 21-9. Lindy McDaniel led a strong bullpen corps with 27 saves and 12 victories. The Cardinals spent most of August and September in second place, although they never seriously challenged the Pirates for the pennant. Success didn’t improve Hemus’s relations with black players. Gibson was again demoted to the minors for a month and chalked up a 5.61 ERA. “Hemus had convinced me that I wasn’t any damn good and, consequently, I wasn’t,” he said in his memoir.25 Flood, so demoralized he couldn’t sleep, got more playing time but hit only .237. Devine got the manager he wanted, Johnny Keane, and the Cardinals took off. Keane put Musial back in the lineup, Gibson in the starting rotation, and Flood in center field. The club rose to second place, sprinting to a 47-33 record under the new manager. Although he was only 38, Hemus never managed in the majors again. He coached for the Mets under Casey Stengel for two years and moved on to the Indians for two more. After managing the Mets’ Triple-A team at Jacksonville in 1966, he left baseball. Hemus prospered as a Texas oil wildcatter. He became a popular figure in sports and business circles in his adopted hometown, Houston, with his big cigars and colorful blazers, and was a generous supporter of the Baseball Assistance Team, which provided financial aid to needy former players and their families. Solly and Marguerite divorced in 1959; they had a daughter, Peggy. In 1989 he married Betty Thomas, and they became world travelers in retirement. Hemus died at 94 on October 2, 2017. Photo credit: Topps Company. For further understanding of Hemus’s relations with black players, I consulted Mark Armour’s presentation, “What About Solly Hemus?” at the 2013 SABR convention: https://sabr.org/convention/sabr43-presentations. This biography was reviewed by Jan Finkel and fact-checked by David Kritzler. 1 Curt Flood with Richard Carter, The Way It Is (New York: Trident, 1971), 51. 2 Peter Golenbock, The Spirit of St. Louis (New York: Harper & Brothers, 2000), 432. 3 Jack Rice, “Hemus Slow on Field, but Thinks Fast,” The Sporting News, October 1, 1958: 6. 4 David Halberstam, October 1964 (New York: Villard, 1994), 110. 5 Ray Gillespie, “Redbirds Rookies Get Their Chance to Chirp Under Marty,” The Sporting News, April 25, 1951: 10. 6 Bob Broeg, “Old Master Marty Lauds Hemus for Hustle and Hitting at Short,” The Sporting News, September 12, 1951: 9. 7 Lee Lowenfish, Branch Rickey (Lincoln: University of Nebraska Press, 2007), 398. 9 The HBP record belongs to Hughie Jennings, who was hit 51 times in 1896. 10 J. Roy Stockton, “‘Somebody May Crowd Out Hemus at Shortstop, But Not Out of Game’ — Stanky,” Post-Dispatch, February 24, 1953: 14. 11 Stockton, “Extra Innings,” Post-Dispatch, October 25, 1953: 1D. 12 Broeg, “Cardinals Buy Shortstop Alex Grammas, ‘Best Since Marion,’” Post-Dispatch, December 2, 1953: 8D. 13 Broeg, “Increased Weight, Prospect of Tighter Infield Could Help Him Win 20 Games, Staley Says,” Post-Dispatch, February 10, 1954: 17. 14 The outcome of three pinch-hit appearances could not be determined because play-by-play accounts were not available at Retrosheet.org. and baseball-reference.com. On those occasions Hemus entered the game as a pinch-hitter and stayed in to get additional at-bats. 15 George Vecsey, Stan Musial: An American Life (ESPN, 2011), location 4216. 16 Allen Lewis, “Hemus Nears End, Wants Managerial Position,” Philadelphia Inquirer, August 18, 1957: 4S. 18 Stan Musial, as told to Bob Broeg, The Man’s Own Story (Garden City, New York: Doubleday, 1964), 262. 19 Jim Brosnan, The Long Season (New York: Harper & Row, 1960), 115. Of the many accounts of this incident, Brosnan’s is the most credible. He witnessed it and wrote about it contemporaneously in his diary of the 1959 season. The game was Hemus’s only start of the year. He retired as an active player in June. 21 Bob Gibson with Lonnie Wheeler, Stranger to the Game (New York: Penguin, 1994), 52.